One of the great Christian music releases of 2013 was the self-titled debut album from Florida band All Things New. The band is named from 2 Corinthians 5:17, which states that in Jesus we are a new creation – the old has gone, the new has come. The ten tracks on that album speak of God’s amazing redemption at the cross. For lead singer Garrett Hornbuckle and the band, they have all found this incredible redemption and forgiveness for themselves. You can read more about the album, and Garrett’s story, from my interview with Garrett from September. Now however, All Things New are expanding that album into a Christmas edition with a bonus three Christmas tunes. Listening to the songs, there was part of me wishing that we might have got more from the band than just three tracks. The first is an original Christmas song, He Has Come. The track is very much in the style of the album it accompanies, with thumping drums and jangly acoustic guitars. The lyrics borrow from traditional carols and focuses on Jesus’ coming to earth, his mission to bring salvation, and his worthiness of praise and celebration. Go Tell it on the Mountain hints at an acapella track before bursting out into a foot-stomping, hand-clapping, harmonica filled version. It’s a lot of fun and very joyful. The last track is Why Can’t It Be Christmastime All Year – a cover of a commercial Christmas song. It gives the band a chance to crack out the sleigh bells, and Garrett an opportunity to yell ‘It’s Christmas, y’all!’ behind a sweet electric guitar solo. If you haven’t picked up a copy of All Things New yet, make the most of this Christmas Edition. I love the way Garrett and the band are declaring that Jesus has come – and that at the cross, he makes us new. I’m putting in a vote now for a full-length Christmas album next year. A full transcript of this interview about the All Things New: Christmas Edition will be posted on Reel Gospel as part of our Christmas music interview series in December. Like us on Facebook or follow us on Twitter to be notified of when it will be posted. 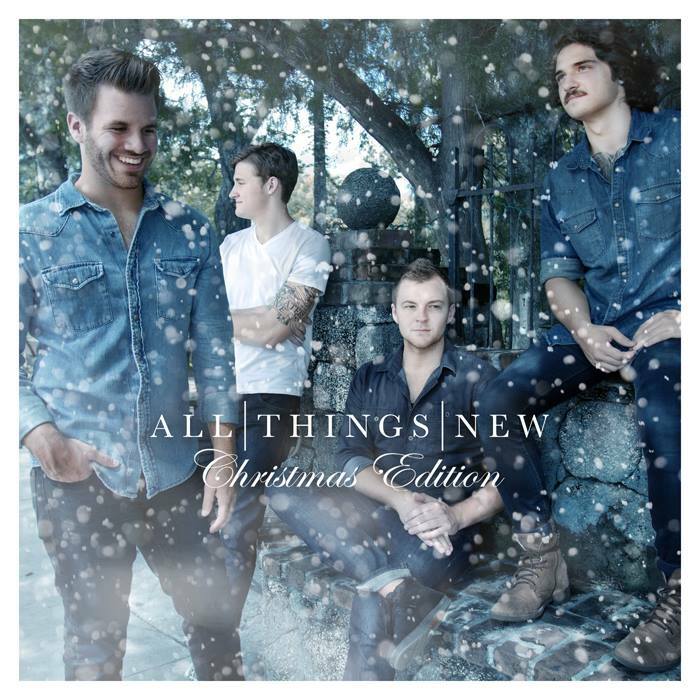 All Things New: Christmas Edition by All Things New is released Monday 25th November and can be purchased on iTunes. Posted in MusicTagged Album, Album Review, All Things New, BEC Recordings, Christmas, Christmas music, Garrett Hornbuckle, Go Tell It On The Mountain, He Has Come, Jesus, Why Can't It Be Christmastime All YearBookmark the permalink.